It is time to rethink the way elections are run. It is time for easy-to-use, online elections that execute flawless voting while connecting organizations to members. It is time for myDirectVote an online voting software solution that allows organizations to quickly create cost-effective, electronic elections in a protected online environment. 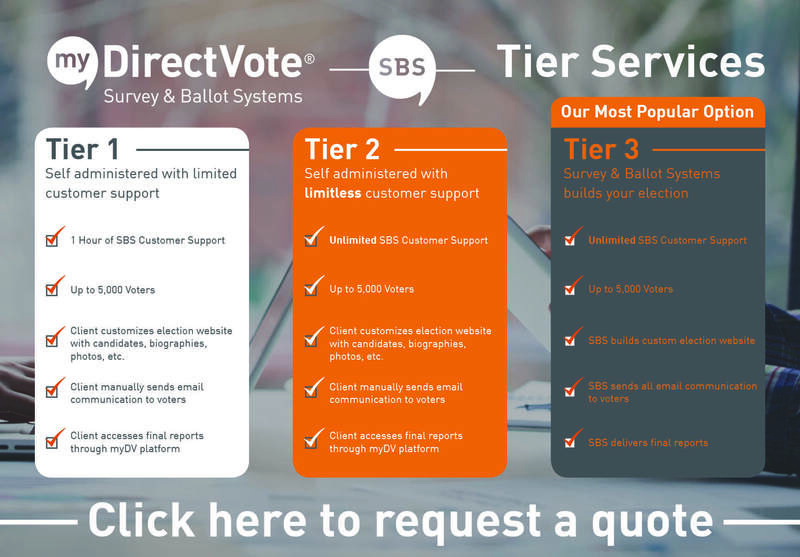 With 3 different pricing and services packages, myDirectVote is designed for: private/recreational clubs, associations, cooperatives, credit unions, student governments, unions, churches, HOAs, law firms/LLPs, and more. Easy setup. User-friendly interface allows for election creation, invitations and custom settings in about an hour regardless of skill level or experience. Custom ballot options. Flexible ballot template with options for branding, detailed biography/bylaw info, photos, random order, write-in options, maximum/minimum votes and rich-text options including linking. Simple administration. Preview the voting pages, upload excel file, set election to “Ready” and election is set. Results are clearly displayed in real-time reports. Settings can be saved and used again for future elections. Email communications – included. Make sure voters know about the election with invitations and reminder emails ­ one invitation and reminder blast included with each election. VeriSign® encryption and authentication protection against unauthorized users (256-bit TLS). .NET framework. Built on a robust, secure web framework that ensures safe pages and automatic updates. Hosted in the cloud. Hosted in CDW’s tier level 4 private cloud datacenter – guaranteeing 99.99% uptime. Development support. Experts available to ensure proper election setup. First 60 minutes of development support included. Mobile friendly pages. myDirectVote detects devices and displays mobile friendly pages when appropriate. Two levels of administration. Two different types of administrator settings that control who is able to see preliminary results. Printable ballots and letters. Print corresponding ballots and election letters for voters. Previous Previous post: Is Your Member Data Secure?